A very interesting photograph from c May 1970, Railway Preservation Society (West Midlands Division), later Chasewater Light Railway, prior to removal from its original home in Hednesford to its new home at Chasewater. During the spring and summer of 1970 the stock was moved to the yard of Cannock Wood colliery by NCB locos for ease of loading for the final move by road to Chasewater. The two bogie coaches were moved by Wrekin Roadways at no cost to the Society. Other items were delivered to Chasewater by the NCB, the only charge being for the move of loco ‘Cannock Wood’. The vehicles in the photo are: a 7-plank coal wagon, the E1 loco ‘Cannock Wood’ (now on the Isle of Wight), the Midland Railway Royal Saloon, built 1910. This was loaned to Derby Corporation for the embryonic Midland Railway Project. It was later exchanged for the ex-Walsall Gas Works Sentinel, some equipment and cash. This vehicle is now at the Midland Railway – Butterley. The other steam loco is ‘Hem Heath No.1’, a Bagnall 0-6-0ST 3077 of 1955, ex Silverdale, which actually worked at Cannock Wood. Between the left-hand window of Cannock Wood and the edge of the photo our Cadbury Van can be seen in the distance. 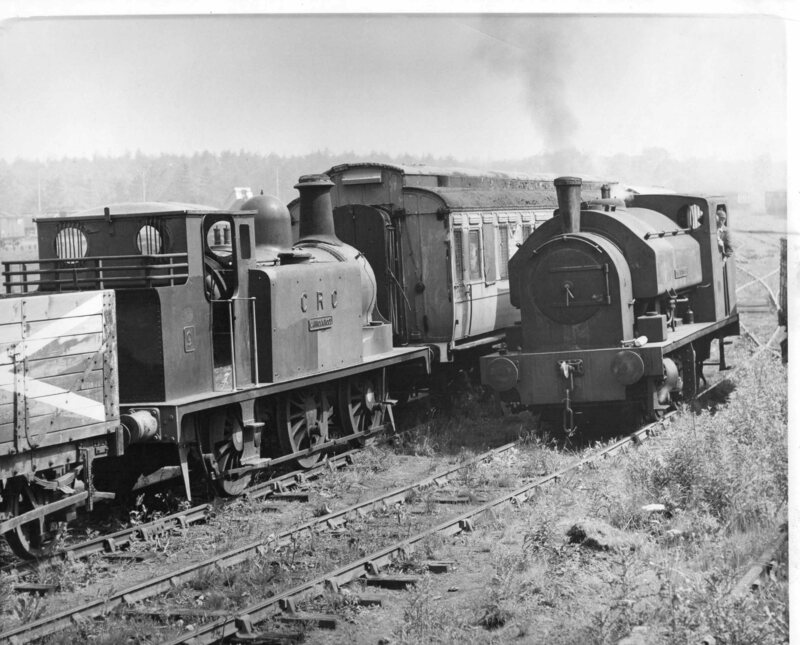 This entry was posted in National Coal Board (NCB), Old Chasewater Railway Photographs, Photograph Collection and tagged Cannock & Rugeley Colliery, Cannock Wood, Hednesford, Hem Heath No.1, LBSCR E1 loco, Midland Railway Royal Saloon, Old Railway Lines, Railway Preservation Society (West Midlands Division), Steam Locomotives. Bookmark the permalink.